By Mike Smith: Adrien ‘The Problem’ Broner (33-4, 24 KOs) says he’s going to be back inside the ring in June for his next fight. Broner isn’t saying who it’ll be, but it’s not expected to be Keith ‘One Time’ Thurman, whose name was mentioned recently as a potential opponent for Broner. Thurman recently made it clear that Broner isn’t someone that he would worry about beating if the two of them fought each other. Broner, 29, isn’t so sure about that. He feels that if he faces Thurman, he’ll knock him out if he hurts him the way that Josesito Lopez did in their fight last January. The best option for Broner to fight in June would be Marcos Maidan, who is said to signing with Premier Boxing Champions to resume his career. However, Maidana, 35, probably has too much weight for him to lose in order to face Broner by June. Maidana will likely want to take some tune-up fights before PBC puts him in with one of their elite level welterweights like Manny Pacquio, Keith Thurman, Shawn Porter or Danny Garcia. Broner is just a level below elite right now based on his performances against Pacquiao, Mikey Garcia, Jessie Vargas, Porter and Adrian Granados. If Maidana is dedicated, he could feasibly take off all the weight he’s carrying to meet Broner in four months from how in June or July. Maidana looks like he would have to lose 50 lbs before he would be back at his old weight. Hes not as heavy as some boxing fans think he is. 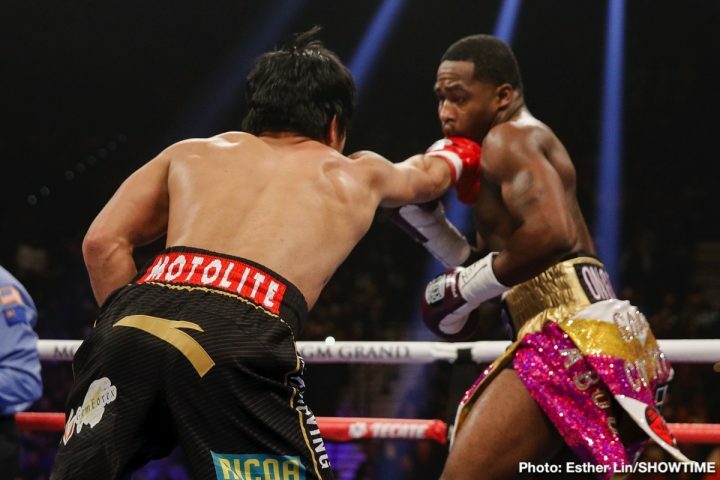 Broner lost his last fight to WBA ‘regular’ welterweight champion Manny Pacquiao on January 19 on SHOWTIME PPV. “I didn’t see it, but a lot of people said it was terrible though,” Broner said about Thurman’s recent comeback fight against fringe contender Josesito Lopez last January. “I don’t wish anything bad on no fighter. He [Thurman] was off two years, so hopefully he gets back in the gym and gets the ring rust off of him, but quit using my name. I don’t be playing all the time like this. You never know where I see you at, and my people don’t be playing no games. He’s got to chill, and just keep to boxing. I been getting that money a long time ago, since Maidana,” Broner said. If Broner is going to get a good payday fight in June, it’s going to have to be against a notable fighter. If not Thurman, then it’ll need to be someone like IBF welterweight champion Errol Spence Jr., WBC champion Shawn Porter or Danny Garcia. There would be no interest for a rematch between Broner and Manny Pacquiao. That fight was a little too one-sided in Manny’s favor for a second fight to make sense. Thurman jumped on social media recently before his fight with Josesito Lopez on January 26, and he took shots at Pacquiao and Broner specifically. Whether that was a move on Thurman’s part to try and increase interest in his fight against Joseisto is unclear. Thurman definitely wants a fight against Pacquiao, but he seems less interested in facing Broner. Thurman doesn’t appear to be afraid of Broner. The likely reason is Broner’s lack of success recently in his fights against Jessie Vargas, Pacquiao and Mikey Garcia. “That s–t sounds cool until you get in the ring withy me,” Broner said to esnewsreporting when told that Thurman believes he’ll easily beat him. “If I hurt Keith Thurman, I’ll stop him. I can’t wait to get back in the ring. I’ll be back in the ring in June. I don’t think I took punishment [against Pacquiao]. I’ll be back in the ring in June,” Broner said. Danny Garcia obviously would be the best option for Broner, 29, to fight in June. Berto hasn’t fought in a while, and it’s unclear whether he would be interested in fighting Broner. Broner lost to Mikey by a 12 round unanimous decision in July 2017. It was a good effort from Broner, but he just started a little too late for him to get the decision. Broner has sparred with Spence in the past. Spence is said to have hurt Broner during the sparring session. However, that was before Broner was fighting at welterweight. Things might be a little different now if Spence were to spar Broner. It would be good preparation for Spence to get ready for his fight against Mikey next month on March 16.